Last night's Community double-header marked the return of show creator Dan Harmon, and the season premiere was the meta-est meta to ever meta. And as a "repiloting" it succeeded in spades, a sharp and funny promise that, even amidst all the changes, Community can be great again. "Repiloting can be intense," Abed tells us in the season premiere. And in Community's case, it really needed to be. In 22 minutes, the show managed to address Dan Harmon's season-long absence (now termed "the gas leak year"), the characters' devolution into caricatures of their former selves, Chevy Chase's permanent graduation, and Donald Glover's impending departure. 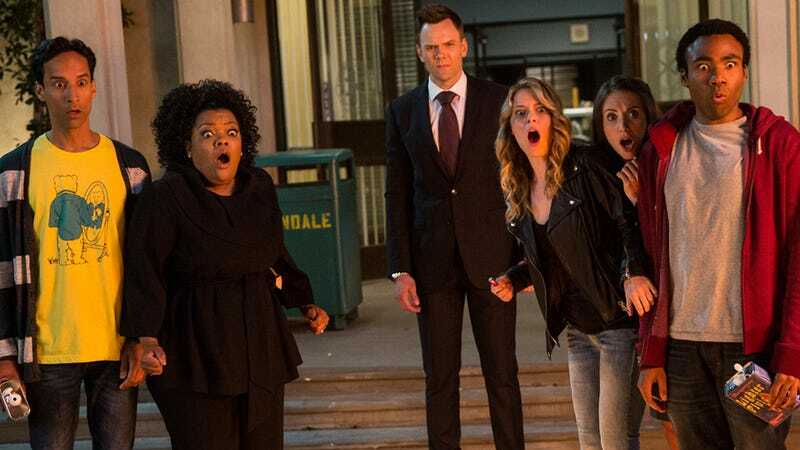 And that's all before we get to the actual plot question: Why should these characters even be hanging around Greendale for a fifth season of community college? The episode managed to push the reset button on a lot of the characters while still acknowledging what has happened to them. While the last two seasons seemed to wrap up Jeff's story arcs, the season opener showed us that Jeff is no good at being a good guy outside of Greendale—at least not yet. Jeff found his monstrous side again, and it was all the scarier for being based on a deep, almost pathological love for his friends. (And we were reminded that Jeff can be just as genre-savvy as Abed when the moment demands it: "You're not worth the monologue.") Shirley is back to being on her own, this time without even her children to look after. Annie realized how easy it was to slip into a terrible, evil job that is beneath her go-getting ways. Chang is thankfully rid of his Changnesia plot line and is back at Greendale teaching math, because what else would he do? Troy and Abed are still Troy and Abed, but the nod to Zach Braff's departure from Scrubs reminded us that soon Abed will have to function without the other half of his handshake. And Britta, well, she continues to Britta up her life. Here's the key reason why this episode worked so well, and why it proves that Harmon truly is the heart and soul of Community: Underneath all the inside jokes and all the madcap weirdness, Community is about a group of people who are not ready to function outside their little world. Community college is supposed to be a stepping stone to the next thing in your life—another school, another job. But while the study group is pretty terrible at making plans for the future, they are thriving in the present. For each and every one of them, being at Greendale is the thing that they are best at. This episode reminded us of that and reminded us what the show is about, like any good repilot should. The second new episode, "Introduction to Teaching," gave us a taste of the new Community order, with Jeff finding his feet as Greendale's newest faculty member. While it isn't the most memorable episode ever to grace our screens, it still had some fantastic moments, such as Jeff feeling culture shock in his new role (he now has to adjust his sparring with Leonard to make his insults teacher-appropriate) and the student riot for "slightly higher grades." Plus, Danny Pudi gifted us with his insane Nic Cage impression. The episode also served to ease us into some subtler aspects of this new Community. Notably, the relationship between Jeff and the Dean has shifted. Gone are the grand costumed entrances; now that Jeff and the Dean are peers, Jeff is privy to the bureaucratic workings of the school, whether he likes it or not. And with Pierce gone, the study group (now the "Save Greendale Committee") has a void, one that is being filled, for the time being, by Breaking Bad's Jonathan Banks, the cartooning criminology professor. Perhaps, with the slew of guest stars scheduled for this season, we'll see a rotating roster of Pierces. Community will never be exactly what it was, with Chevy Chase and a full season of Donald Glover and Jeff figuring out which blowoff class would get him out of Greendale fastest. But it can still be a smart and heartfelt show about a group of misfits trying to figure out their lives, and enjoying each other's friendship in the meantime. Hopefully, the next few episodes will live up to the promises of the pilot, but I for one am ready to say: Welcome home, Dan Harmon. Welcome home.